May I suggest a Checkbox to make it always on top? You could also have one to allow clipboard watch using OnClipboardChange, so that when activated would automatically update it when a snippet is copied. I don't think that the AlwaysOnTop checkbox would be a good idea, mainly because if anyone frequently needs windows to be on top, they probably have a hotkey or something to change other windows like I do. The clipboard idea sounds interesting, but I don't think I would use it, and the source is right there for anyone to edit. the source is right there for anyone to edit. Sure. I just thought you would like to update it sometime. Very nice Geekdude, congratulations on the good work. "What is a suitable automation? Whatever saves your day for the greater matters." also maybe a checkbox for IRC if they dont check it then send the url return of AhkBin() to clipboard ? 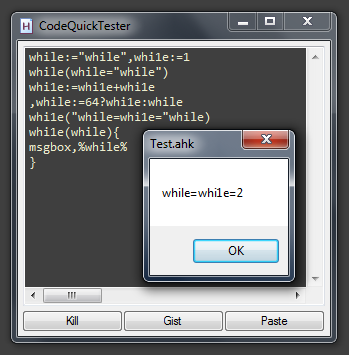 Thank you for updating this script, but I think a hotkey like Alt + Esc to close Test.ahk script will be better. Excellent work Mr T. Going to try to break it for you..